Lucille Paquin Obituary - Haileybury, Ontario | Buffam Leveille Funeral Home Ltd.
Paquin, Lucille Marie-Jeanne - With sorrow the family announces the death of Mrs Lucille Paquin on Thursday, February 1, 2018 at the age of 89 years. 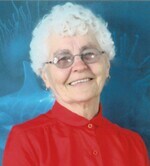 Mrs Paquin passed away in the comfort of her home with her loving family by her side. Born at St-Cyril de Wendover, Quebec on August 20, 1928, she was the daughter of the late Sylvestre Lavigne and the late Maria Laferière. Many will remember Mrs Paquin as an RNA who worked over 40 years in the field of nursing at Misericordia Hospital in Haileybury and Tri-Town Extendicare Nursing Home. In her retirement she enjoyed gardening, knitting and doing crossword puzzles. She had been a faithful member of Holy Cross Church for many years. Predeceased by her parents; daughter Anne-Marie Paquin on October 1, 1978, son Marcel Paquin on May 4, 1989 and her siblings: Sister Marcelle Lavigne, Placide Lavigne and Jeanne Alice Lavigne. Left to mourn is her loving and devoted husband Maurice Paquin whom she married 62 years ago on September 14, 1955. Sadly missed by her children: Michel Paquin of Cobalt, Luc Paquin of Africa, Serge Paquin of British Columbia and Rita Paquin of New Liskeard. Fondly remembered by grandchildren: Mitchell, Kyle, Lucille, Tyler, Phoebe, Daniel, Tyler, Mario and Natalie. Also survived by great-grandchildren: Sophie, Felicity and Remi; and by her brother Jean-Marie Lavigne of Angliers, Quebec. A memorial service will be held at Holy Cross Catholic Church, Saturday, April 28, 2018 at 11:00am. Father Marcel Bruneau officiating. Interment will take place at the Haileybury Catholic Cemetery. Memorial contributions to Community Cancer Care will be gratefully acknowledged. Condolences, contributions and memorial candles may be left at www.buffamleveille.com.